Two exclusive three-bedroom suites are available for the discerning guest on the residence’s top floor. With its great features and panoramic city views, these units provide a classy and homely place to stay in this metropolis. They are the perfect pick for families visiting Bangkok, small groups of visitors or single travelers expecting acquaintances and associates. The roomy interior imparts a feeling of space and brightness where one can indulge in leisure time with friends, cook newly learnt Thai dishes in the very convenient kitchenette,and make future business and holiday plans. All our modern kitchenettes feature handy appliances and amenities. Space management and ease of use were predominant factors taken into account when designing them. The aesthetic element was of course not neglected as can be seen from the tiling, use of wood and stainless steel. The kitchenettes include a refrigerator, a sink, a microwave, electronic hot plates, a complete cutlery set, and very useful cupboards. Whatever your cooking skills are, you will enjoy the practicality and atmosphere of your kitchenette. With its esthetic and sober design, the bathroom is both pleasurable and very practical. Modern amenities are featured, including hot/cold shower-bathtubs and hairdryers. 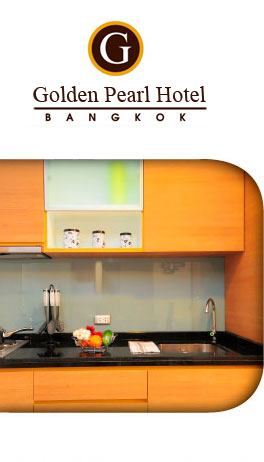 Golden Pearl has a selection of 79 suites to choose from. All have been stylishly designed while keeping practicality and safety issues in mind. Neat furniture combined with contemporary art and subtle indirect lighting produce a true feeling of well-being and serenity. 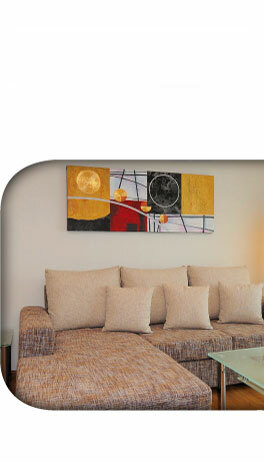 Amenities include plasma televisions, personal micro component systems and Wi-Fi Internet access. Each unit is equipped with a very handy kitchenette, an elegant bathroom and a balcony where one can read the morning newspaper while sipping a cup of coffee. Both the businessperson and the leisure traveler will find that Golden Pearl is the ideal place to relax in style and to enjoy a good night’s sleep.